THE BEST EFFECTIVE FORMULA FOR DAMAGE REPAIR AND GREASINESS CONTROL - Absorbs Excess Oil And Repairs Damage - 100% Pure, Natural & Cold Processed - Free From SLS, Chemicals, Synthetic Colour Or Fragrance - Ideal For Normal To Dry Hair And Scalp Types Benefits - For Oil - Free Thick And Shiny Hair! 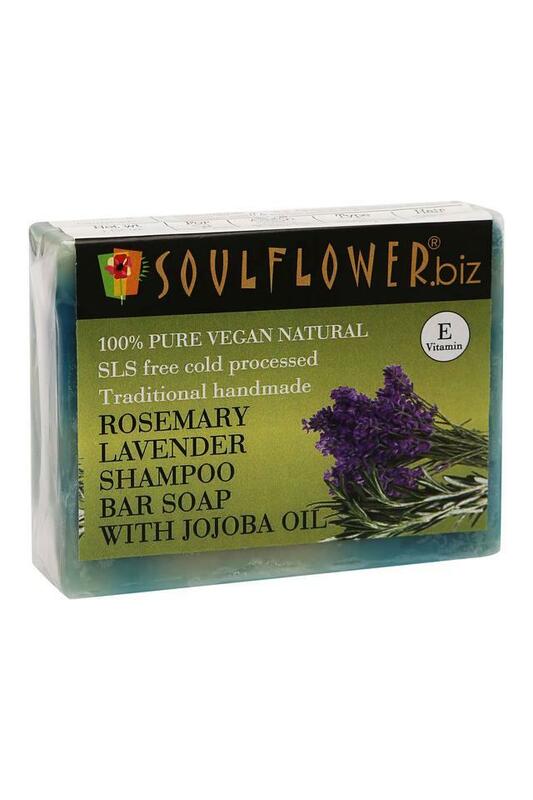 Soulflower promises quality in every bit and provides authentic pure and natural cold processed shampoo bar soaps infused with life - changing wellness benefits suitable for a beautiful healthy stress - free lifestyle. Rosemary Lavender Shampoo Bar Soap With Jojoba Oil, a slice of nature’s pure essence is extracted from the fatty portions of natural lavender, rosemary, avocado, wheat germ, aloe vera, cocoa butter, reetha, shikakai, jojoba, castor and coconut with stearic acid and vitamin E and without using added heat which helps to keep fragile nutrients unprocessed. 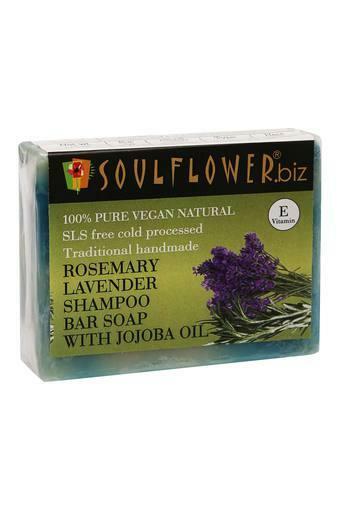 Experience clean, shiny and refreshed hair with Soulflower Rosemary Lavender Shampoo Bar Soap With Jojoba Oil perfect therapy for normal to dry hair scalp types. It stimulates your hair follicles, controls hair fall, removes impurities and helps get rid of split ends and grey hair. 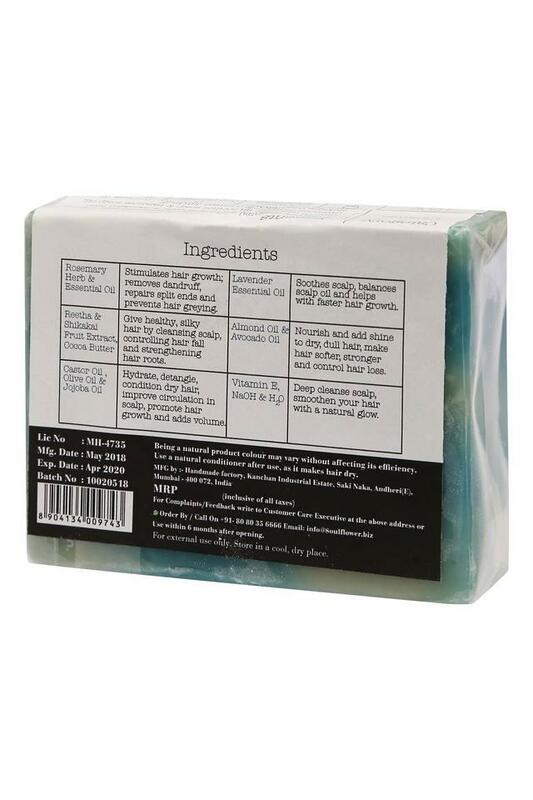 This shampoo bar also soothes scalp & balances scalp oil secretion, conditions and adds shine to your dry, dull hair, makes hair softer and stronger. How To - Cut the Soulflower Rosemary Lavender Shampoo Bar Soap into two pieces, store unused piece in a cool dry place. Dampen your hair, make lather in the hand and work the lather thoroughly onto hair and scalp with finger tips. Rinse your hair and scalp while scrubbing diligently to ensure you wash all residue. Repeat if necessary. Use twice or thrice a week to regain hair lustre, nourished scalp & healthy beautiful hair. 100% Pure, Natural, Vegan, Handmade and Cold Processed Soulflower Rosemary Lavender Shampoo Bar Soap with Jojoba Oil removes impurities and absorbs excess oil without stripping hair of natural sebum. 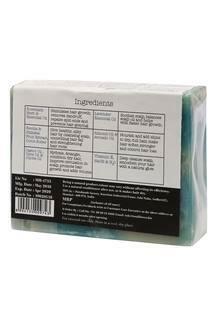 Rich, sudsy lather of this bar nourishes scalp, controls hair fall, repairs damage and promotes healthy, shiny hair.